Eat. Sleep. Repeat. That was the rough plan of attack for my recent virgin visit to Hong Kong. With a serious dossier of dining recommendations from a chef friend under my wing, I felt well prepared for the eat part. 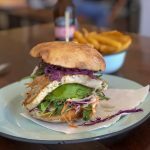 But sometimes while travelling overseas I also like to play food tourist. 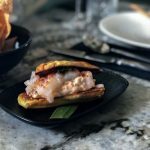 So I booked Mr GFAF and myself on a Hong Kong Foodie Tours exploration of the Central and Sheung Wan areas of Hong Kong for a local’s taste of the traditional food scene. Armed with an appetite and shoes for walking we hit the streets to explore the tastes and sights of Hong Kong’s diverse food scene. 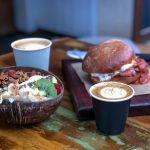 Our Hong Kong Foodie Tours guide was Nicole, an Aussie ex-pat living in Hong Kong with her husband who works as an international pilot and their local rescue dog. 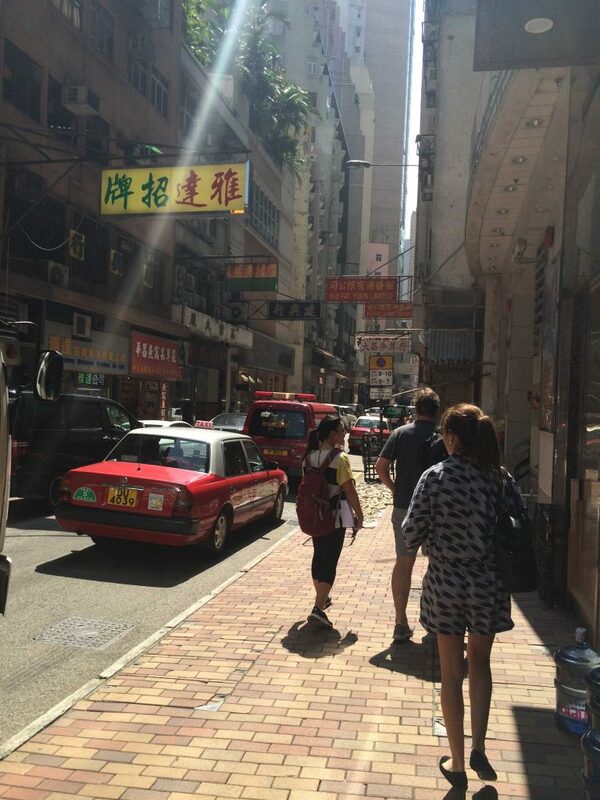 There were just four of us on Nicole’s tour of the Central and Sheung Wan areas of Hong Kong Island – two Australian couples – which made the half day walking expedition extra personalised. 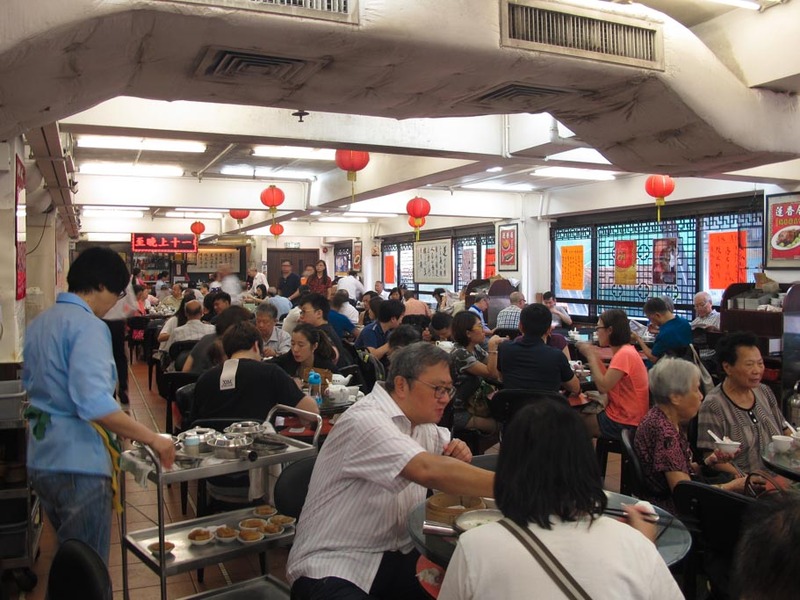 The tour included visits to a number of family run food businesses and restaurants serving authentic Hong Kong cuisine – from the traditional Cantonese flavours of Dim Sum and Char Siu to popular dishes that have English influences such as Milk Tea and Egg Tarts. In Australia, what we call Yum Cha is more correctly Dim Sum. Yum Cha actually translates to ‘drinking tea’ while Dim Sum translates as ‘touching the heart’ and refers to the little morsels that are served in the tea houses alongside bottomless pots of tea. The entry to the tea house is discrete with a quiet lift ride up to the restaurant. When the doors part open there is a cacophony of chatter, jingling teacups and saucers, roast red ducks hanging under hot lights and the smell of a scalding Chinese kitchen. It’s loud and vast and I love it. The Lin Heung Kui Tea House is one of the few Dim Sum restaurants in Hong Kong where they still have trolley ladies who wheel around towers of steamer baskets. The trolley ladies peddled their fare, performing the steamer lid reveals, as we looked to Nicole for guidance. She thankfully acted as our translator and helped us choose dishes such as pork and prawn dumplings, spring rolls, rice noodle rolls, sweet bao and pots of jasmine tea. 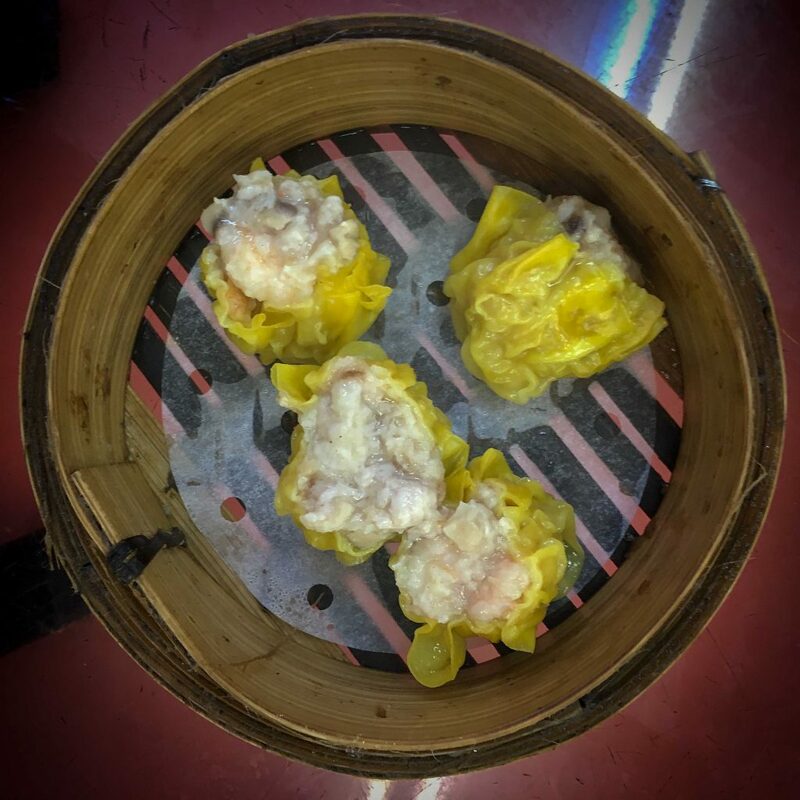 Verdict: An authentic, delicious Dim Sum experience. It helps to have someone with you to translate, otherwise just be daring. The chicken feet are a dead giveaway! 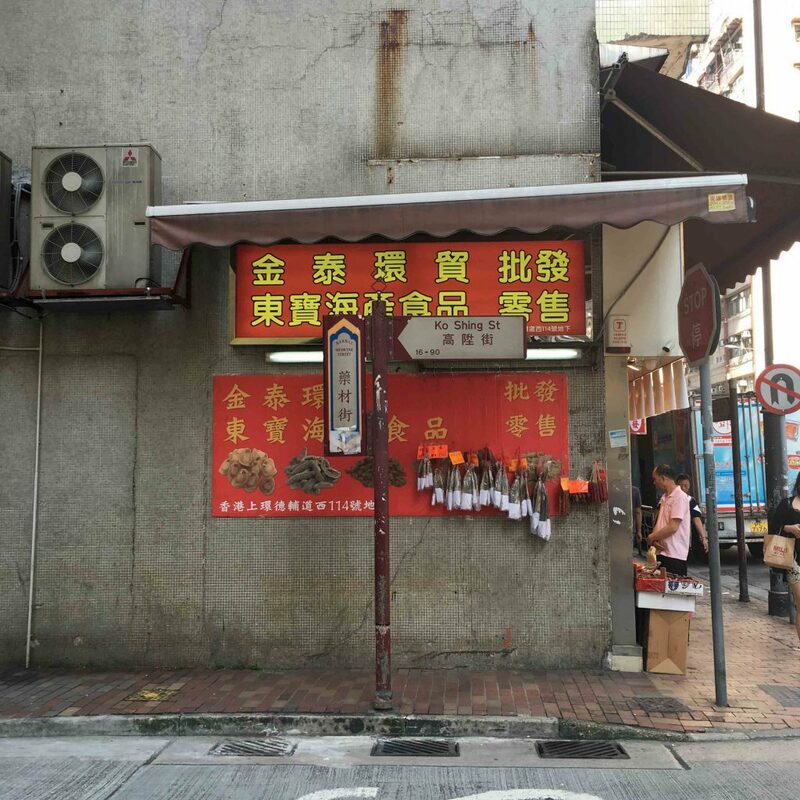 We then took a walk along Wing Lok Street and Des Voeux Road West where there is an abundance of dried seafood shops. They sell everything from dried oysters to sharks fins, bird nests, dried scallops and things I couldn’t recognise. 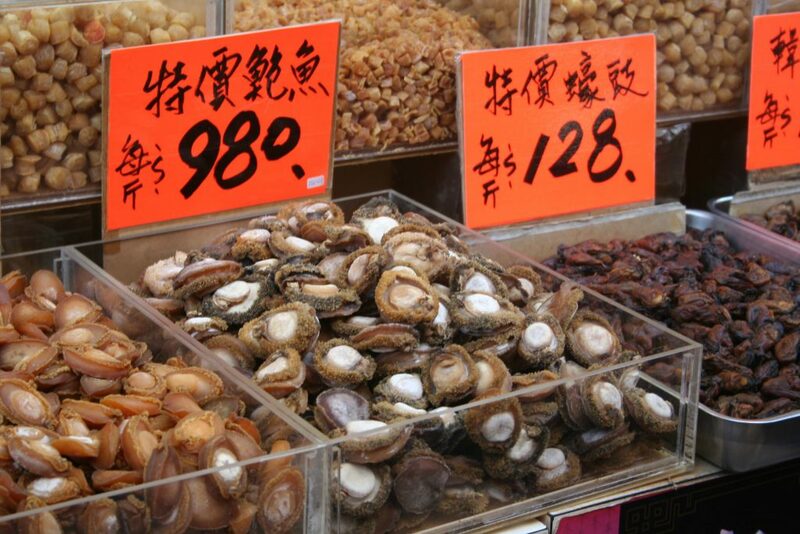 The Chinese eat the dried seafood for medicinal benefits, but some of the ‘foods’ also symbolise wealth and are meant to bring fortune to those who eat them. 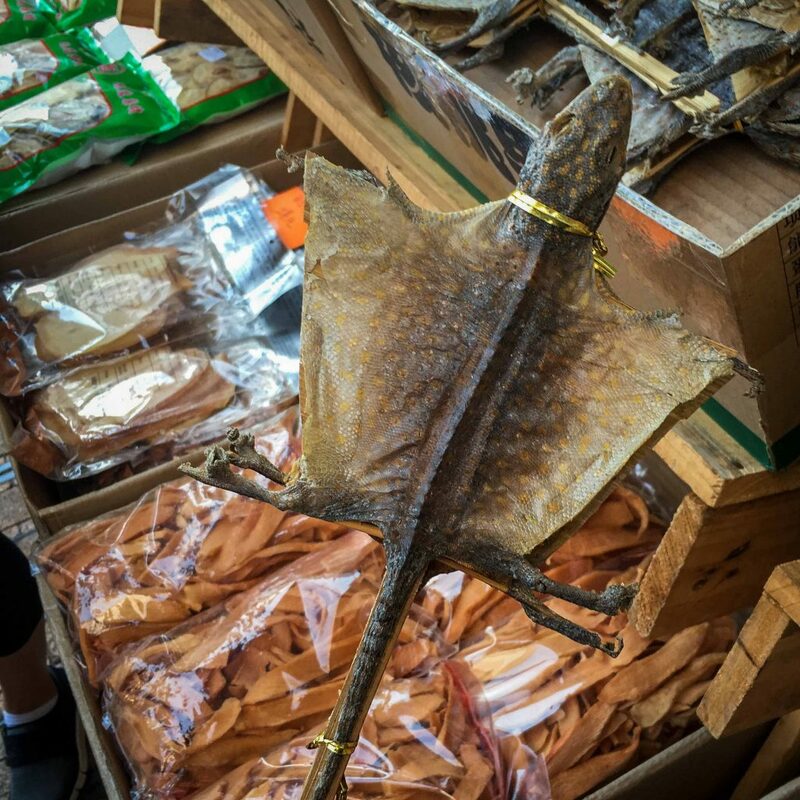 My favourite was the dried Gecko ‘Paddle Pop’ – a dried male and a dried female gecko tied to a popsicle stick that you dunk in tea or broth. It’s meant to make men virile and help women conceive a baby boy. We also called into a Chinese Medicine clinic where there were some weird and unsavoury things in glass cabinets. I’ll spare you the details. 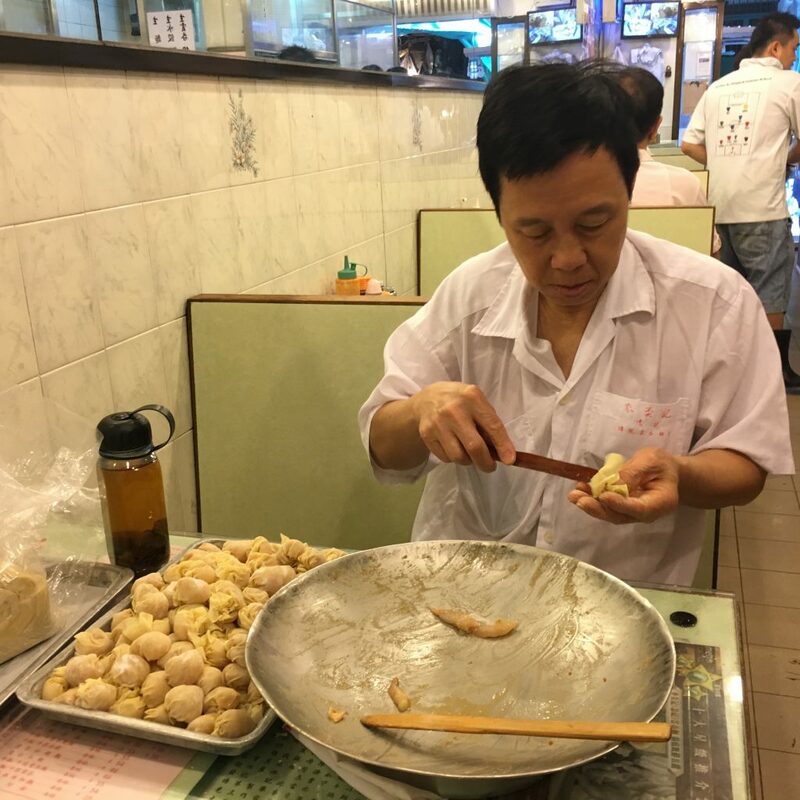 Our next stop on the Hong Kong Foodie Tours itinerary was Mak Man Kee – a slip of a restaurant with about 20 seats that makes the best wonton noodle soup you will taste. This one was on my chef friend’s list of recommended places to eat so I was extra excited. You can choose from a variety of wonton fillings like traditional shrimp or pork, but the Beef Brisket Noodle Soup is popular and was Nicole’s recommendation. The keys to a good wonton soup are al dente noodles – they massage the noodles before cooking them for added softness – as well as a light and steaming broth and wontons with extra fine skins. At Mak Man Kee’s they also add a secret ingredient to the wonton filling – peanut butter! Verdict: Slurp on the most delicious wonton noodle soup while watching the staff hand make wontons at lightning speed on the table next to you. 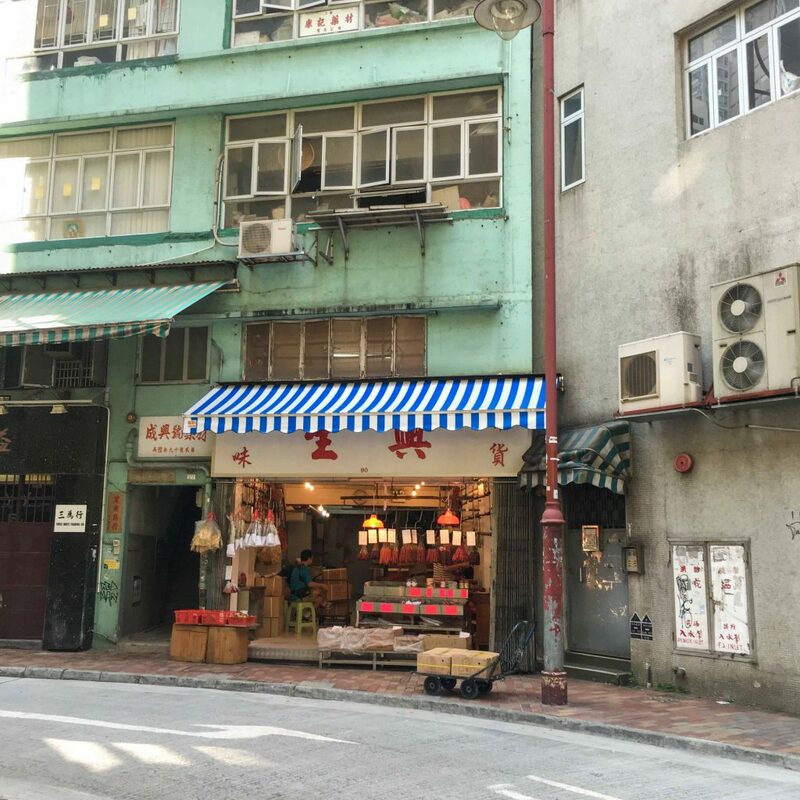 We then walked along Wellington Street and the Tong Lau tenement block (or what is left of it) past the fresh fruit and vegetable stalls and the Graham Street wet market to see the fishmonger and the traditional pork butcher on Gage Street. 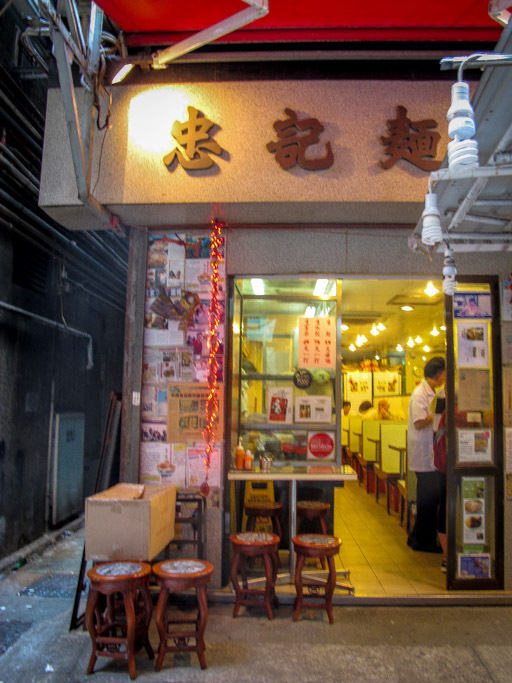 A few steps away we stopped for Milk Tea – our first taste of East meets West or Chinese meets English flavours. Milk Tea is a popular drink that blends Chinese style tea with evapourated milk and sweetener. You can order the tea cold on ice or served hot. They even offer a blend of half coffee and half tea. 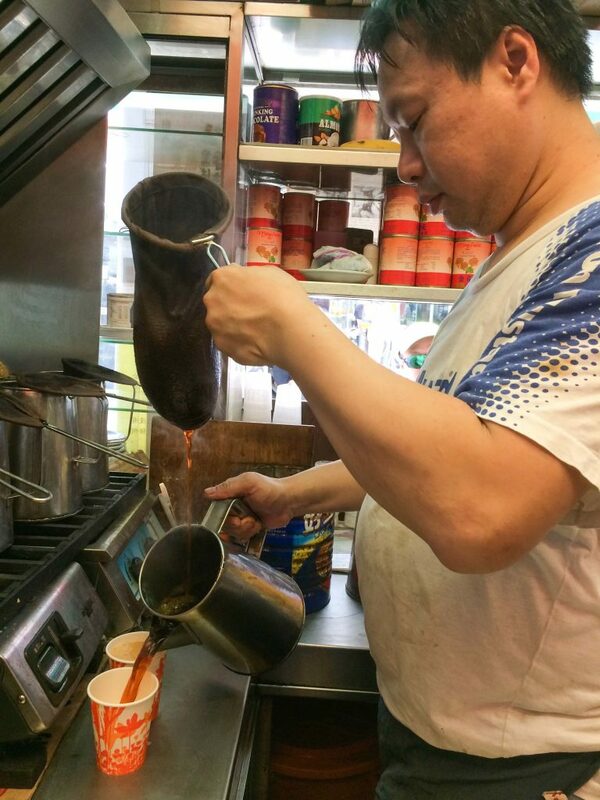 The Lan Fong Yuen Milk Tea stall is famous and the tradition goes that the original recipe was brewed using the owner’s Grandmother’s stockings as a ‘tea bag’. Verdict: The cold milk tea was perfect for a hot morning. If like me you don’t have a big sweet tooth, make sure you ask for a small amount of sugar instead of the standard serve. We then walked down alongside the famous Hong Kong escalator that reaches up the hill for 1.5km to catch a Ding Ding or local tram to the Wan Chai area. You enter the double decker trams via the back door and pay as you leave via the front. The price is around 40c a journey no matter how far you ride. As we turned into Stewart Road we ran into a sprawling crowd of people gathered around the street corner. We wondered what was going on. Nicole then explained that the crowd was in fact a queue of workers waiting for their lunchtime takeaway order from our next restaurant – Joy Hing. We were dining in so we waited in the crowd for a short while until a table was available. 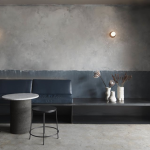 Inside we huddled together on mini stools around a teeny table as the team of chefs at the front of the restaurant smashed their cleavers though an endless supply of suckling Char Siu and other sticky roasted meats. Our pork arrived with steamed rice, wok fried greens and a traditional dipping sauce that included shallots, ginger, garlic and oil. 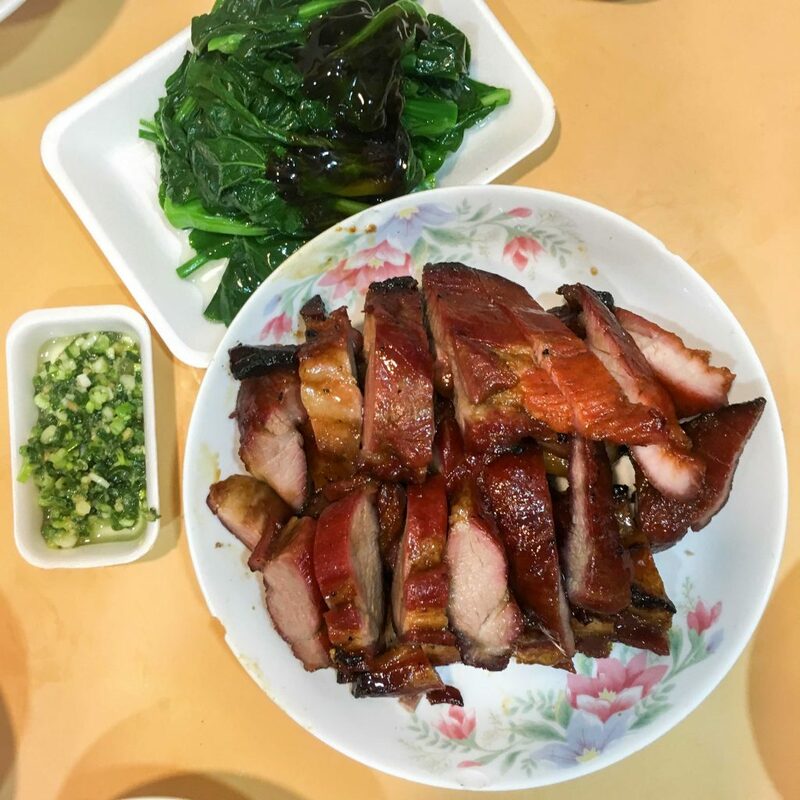 I can honestly say that it was the best tasting Char Siu I have ever eaten – succulent, sweet and soft – and we kept diving in with the chopsticks until we could fit no more. The Egg Tart is another Hong Kong dish that the English introduced to the Chinese. 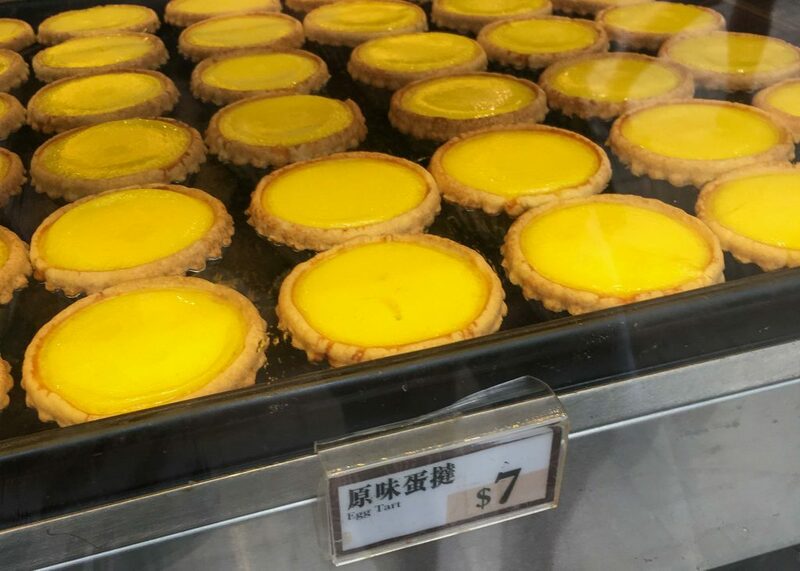 The version sold from bakeries all over Hong Kong has a short crust pastry filled with rich golden custard that is served warm. They are small and delicate and delicious. Just as we arrived at the Tai Cheong bakery a phone order was placed for 500 Egg Tarts because it was the night of the Mid-Autumn Festival and everyone was celebrating. That left only a few tarts in the cabinet so we had one tart between two which was more than enough given the food antics of the morning. Verdict: I enjoyed the richness custard of the egg tart but I preferred the flaky puff pastry of the Portuguese Custard Tart that I enjoyed a few days later when visiting Macau. 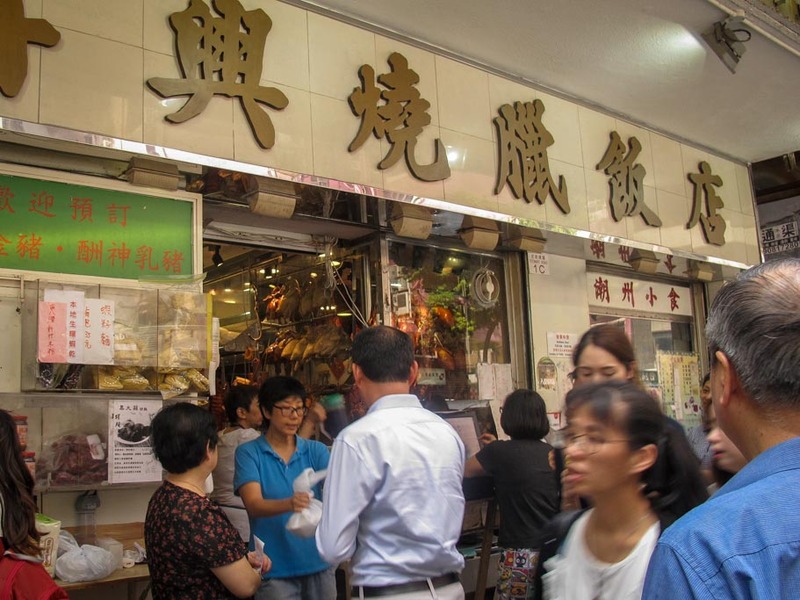 The Hong Kong Foodie Tours exploration of the Central and Sheung Wan areas of the island was a great introduction to the traditional local food scene. 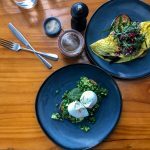 I can recommend it for foodies who want to see things from a local’s perspective or for anyone who wants to taste authentic Hong Kong cuisine but might not know where to start. I slept well that night and hit repeat the next day with a taste for the new and old flavours of Hong Kong.